We have many different elephant design for you to chose from and if you are looking for something cute and adorable, then this is the design for you. 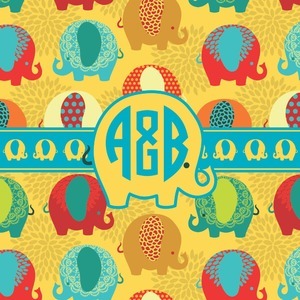 This cute elephants design is absolutely the most adorable design. It has cute & pudgy elephants in different colors on a tone on tone background on mum flowers. The background color is re-color-able - and we chose to use the yellow African safari color. We created a ribbon & label just for this design with the adorable elephants and used them both and coordinated with teal. 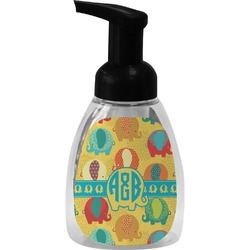 For the personalization, we chose the round monogram as we thought it looked adorable with the cute elephant label. On this design, we offer a color choice - the vibrant and beautiful yellows and teals or the soft, muted and sophisticated greys, reds & pinks. We chose to feature the vibrant colors; it is super easy to change to the other color set in our customization system.